A State grant to the Football Association of Ireland of up to €5m towards the cost of upgrading the Aviva Stadium for Euro 2020 is under threat as pressure mounts on the FAI to fully account for the €100,000 loan from its former chief executive John Delaney. 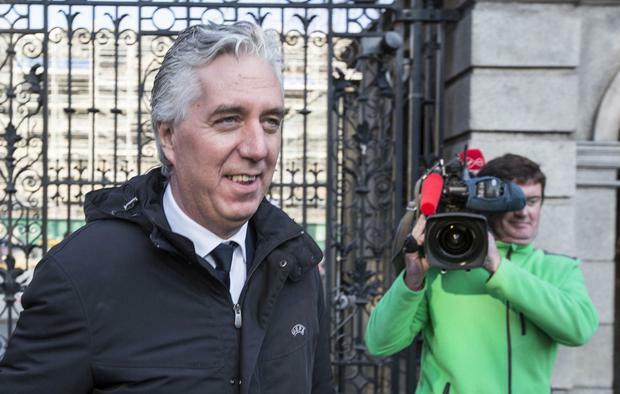 The news comes as Mr Delaney's future with the FAI looks increasingly in doubt. The FAI is refusing to comment amid strong indications that Mr Delaney's position as executive vice-president will formally end this weekend. The Sunday Independent understands that Mr Delaney, who stood down as CEO three weeks ago shortly after news of the loan emerged, has indicated to friends his time with the FAI is up. John O'Regan, honorary secretary of the Kerry District League, last night told the Sunday Independent that he had received a text from Mr Delaney and had then spoken with him by telephone. "He told me he had offered his resignation and the board will consider that on Monday. He said he intends to continue in his UEFA role," he said. "I thought he sounded a bit relieved. He's had a hard few weeks. Some people jumped on the bandwagon to slate him but he has done a lot of good," said Mr O'Regan. "He made a mistake and he admitted it. "He was unbelievably supportive in encouraging the development of soccer in Kerry and when we put in applications for grants, he would endorse them," he said. Last night, sources close to the FAI said the outcome of talks may see Mr Delaney "exit with dignity" from the FAI but maintain his position on the UEFA executive committee. However, Mr Delaney's departure now is unlikely to draw a line under the FAI loan controversy. Dublin has been chosen as one of the host cities for next year's European Championships and four games will be played at the stadium, which must now be upgraded to meet UEFA requirements. In his first public comment related to the FAI controversy, Sports Minister Shane Ross has told the Sunday Independent: "Boards should now be on notice that it is unthinkable that any sporting body whose corporate governance is under a cloud could be considered for large-scale capital grants." The FAI had intended to apply for the grant under a new government initiative known as the Large Scale Sport Infrastructure Fund, which will see €100m made available to sporting organisations for the construction or redevelopment of sporting venues. High-level FAI discussions over the weekend have focused on the position of Mr Delaney. However, strong doubts also surround the future of FAI honorary secretary, Michael Cody, the only existing board member who was aware of Mr Delaney's €100,000 loan in 2017. Honorary treasurer Eddie Murray, who was unaware of the transaction, is not expected to be a member of any future FAI board. Among the other high-profile stadia hoping to receive State funding for redevelopments are The Sportsground, home of Connacht Rugby, and Pairc Tailteann in Navan. But in a week in which the FAI has come in for widespread criticism following an at-times shambolic appearance before an Oireachtas Committee, it has now emerged that senior Government figures are deeply uncomfortable with advancing grants to the association while many questions over its governance and finances remain unanswered. The Sunday Independent learned that the Government intends to take a tough stance against any sporting organisation whose corporate governance standards fall short of what is expected or is not in good standing. The FAI's funding from Sport Ireland has been suspended, including a payment of more than €1.3m, which was due this year. The Department of Sport and senior Government figures were supportive of that decision and look set to follow suit. The closing date for applications for the state capital grants is 5pm this Wednesday. Funding is also likely to be sought for the redevelopment of Dalymount Park, and although this is being done through Dublin City Council, the stadium's owners, its strong links with the FAI - who have trumpeted the project - may also see it falling foul of the association's current difficulties. Funding for the Glanmire soccer centre - a joint venture between Foras (the trust which runs Cork City) and the FAI - may also be threatened. The FAI is not a public body and so is not directly answerable to the Government, but it must account for the money it receives annually from Sport Ireland. The association and its affiliates also receive grants from the public purse through other schemes, such as the sports capital programme. Pressure has continued to mount on the association over the weekend. Delaney was recently appointed to the newly-created role of executive vice president, with Rea Walsh installed as interim CEO. Delaney was silent for large parts of his appearance at Leinster House due to legal advice which he said precluded him from elaborating in detail on the circumstances behind his €100,000 bridging loan to the FAI in April 2017. Only three members of the board, including Delaney, were aware of the loan at the time, and there is no reference to it in the audited accounts for the year. The Sunday Independent has also learned that a second soccer club was left waiting for prize money and grant payments owed to it by the FAI when former chief executive John Delaney gave a €100,000 loan to the embattled association. Documents seen by this paper reveal that Bray Wanderers contacted the FAI in March 2017 seeking the €22,000 it was owed in outstanding prize money, UEFA funding and other grants, but were left waiting more than five weeks for a partial payment of €12,000. Dundalk FC also encountered delays accessing UEFA prize money through the FAI at the same time as Bray, and referees were engaged in a dispute as they sought assurances their match expenses would be paid on time. A third club told this paper yesterday that it regularly has had issues with securing prize money from the FAI. Meanwhile, sponsors have increased the pressure on the embattled association in the past week. Nine of the FAI's biggest partners failed to say their investments in Irish football were safe when contacted by the Sunday Independent last week, with many, including Three, New Balance, Ford and Bus Eireann admitting to monitoring the return their partnerships deliver. SSE Airtricity, the League of Ireland's major sponsor, said it would discuss developments with the association in a meeting scheduled to take place "in the coming weeks".